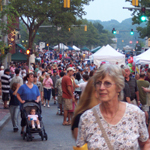 From May to September, on the 3rd Thursday of each month, 6 blocks of Main St. are closed to vehicular traffic for the evening & filled with festival-goers. Thousands of pedestrians browse merchandise within a background of musical, theatrical, visual & olfactory delights. There are clowns and bands and stilters to entertain you as you meander through the fest. Local & regional vendors set tables in the street showcasing the wealth of goods produced in CT. This area is rich in musical talent. Seven stages, placed along Main Street, have continuous performances ranging from rhythm & blues to Latin jazz to folk rock to African drumming. The music is interspersed with performances by dance troupes, Kung Fu and puppeteers. Street performers and children’s events are strategically placed throughout Main Street so a new adventure is always unfolding. One block may hold the Bounce Room and another face painting. Kids of all ages will have something special to enjoy. Our cultural diversity brings wonderful food to the festival. There’s authentic Indian, Mexican, Syrian, Puerto Rican, Italian, and Ukrainian food vendors providing gastronomic delights from around the world. And there’s old-fashioned ice cream floats and other great desserts!